Not many genres can be traced back to a single musician. 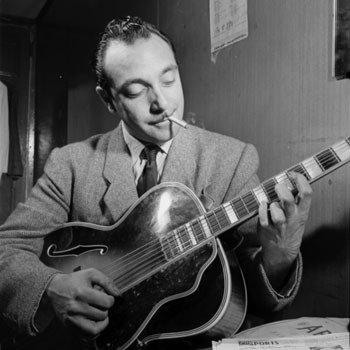 However, the consensus among most musicologists and players of this style is that Django Reinhardt is the father of Gypsy Jazz beginning with the music he created in France in the 1930s. Some of the Django’s early influences were naturally some of the great American jazz musicians and bands of the time but also French impressionism (Debussy, Ravel, Satie). You can hear the impressionism influences in gypsy jazz with the frequent use of 6th chords as well as in some of the diminished and whole-tone runs. Nowadays, the genre has expanded with players and influences from all over the world. Modern-day professional gypsy jazz guitarists may incorporate South American, blues, rock, country, and other influences that push the genre to new territories. What most often remains consistent in the modern styles is the early Django influences, the style of guitars or instrumentation, and the blazing technical prowess of the musicians. Here are some of my favorite modern artists and their most recent albums. Each of the 5 guitarist on this list have jaw-dropping technique, but Joscho Stephan may in fact be otherworldly. In Troy Grady’s brilliant interview series from “Cracking the Code,” Joscho sits down with Troy to dissect elements of Joscho’s personal approach as well as the general gypsy jazz style of playing. The cameras show the unwavering fluidity at which Joscho’s picking hand moves. I encourage anyone to explore Grady’s Cracking the Code for this and many other reasons. Joscho’s 2015 release Guitar Heroes features 3 other phenomenal guitarists, the one-man band from Australia, Tommy Emmanuel and gypsy jazz legends, Biréli Lagréne and Stochelo Rosenberg, on an album that blends gypsy swing with rock, blues, jazz, and funk. From Django to Jimi, there’s a great mix of styles on this album, pumped out by some of the biggest and baddest steel string hard-hitters around. Argentine guitarist Gonzalo Bergara is another prime example of a guitarist pushing the stylistic boundaries of gypsy jazz. Blues and South American influences make their way into much of his music. Though he can certainly hold his own among the other technically masterful players on this list, his sound and phrasing are some of the most pleasing elements of his playing. His compositions and arrangements are also well thought out and quite moving. This is true for the music on his most recent album, Claroscuro. On this album you can hear a wonderful use of textures, both made acoustically and with some tasteful studio work. Stéphane Wrembel is a French born guitarist with a lengthy discography. He’s well-known for “Bistro Fada,” the theme song for the Woody Allen Oscar winning film, Midnight in Paris. (Side Note: I recorded a cover of this song; you can find the link HERE.) Stéphane incorporates an eclectic mix of world music with gypsy jazz and doesn’t shy from using effects pedals. The Django Experiment III is Stéphane’s most recent album. It features 3 songs by Django Reinhardt and 9 other compositions by other gypsy jazz artists from around the time of Django. This is a great album to hear modern interpretations on traditional gypsy jazz music. Led by violinist Jason Anick and Finish guitarist Olli Soikkeli, Rhythm Future Quartet (named after the Django tune, “Rhythm Future”) takes influences from Django’s Hot Club of France and mixes it with international rhythms and harmonies. While their first self-titled album was more traditional in style, their most recent release, Travels, features original compositions and arrangements with an even broader array of influences. All About Jazz and the Huffington Post dubbed Travels as one of the best jazz albums of 2016. Olli Soikkeli is one of the most impressive young guitarists around. He’s a featured artist on Jam Track Central where you can download some of his instructional material. Thanks for this list which has uncovered some interesting players that I’ve missed. While I agree that Joscho Stephan’s technique is “other worldly” he, for me, over plays way, way, way too much. Music is about emotion and feel. After hearing Stephan do crazy gymnastics on the fretboard over and over and over again, I start screaming “give me some melody!”, “give me some emotion and feel instead of just pedal to the metal!”. He can do it. When you watch him on YouTube playing his own composition “Papillon” (not his recorded version where his playing is not up to the same standard) you go “WOW!”. Every note is tastefully executed, his technically brilliant runs wonderfully integrated and every note is perfect throughout with little surprises here and there taking me places I didn’t expect. Sadly, everything else I’ve seen or heard from him is not up to that standard. He needs to mature and realize that music is not about gymnastics but about playing the right notes at the right time to provide an emotional experience that takes us somewhere different. My top of the list would be Romane who rarely over plays, who’s sense of timing and phrasing always gives me something different and above all, takes me emotionally to that place that gypsy jazz is meant to be taken. Plus he’s written some classic gypsy jazz compositions. Thank you for your comment, Wolfgang. I’ll be sure to check out Romane. Cheers!